Regardless of whether you are a perfectly organized homeschool mom or not, you've probably given some thought to high school records. 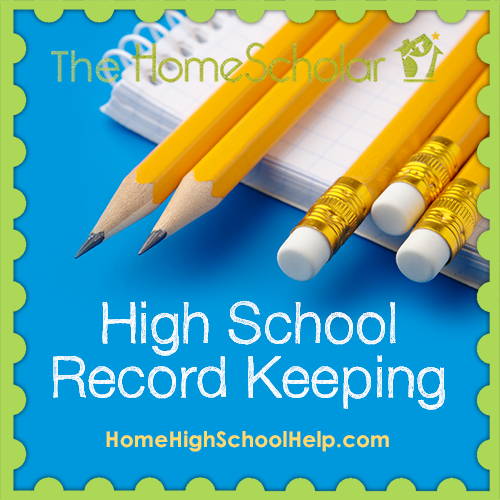 Whether you feel the panic, want to stick your head in the sand, or are confident about planning and your ability to carry it out, it’s important for every homeschool parent to consider record keeping in high school. Perhaps it’s only a vague thought, and you say to yourself, “I’ll get to that someday.” But time has a way of sneaking up on you. Even if you are convinced your student will never go to college, chances are high that at some point in the future you will need to provide records of your student’s high school experience. You may need records for your child to become a camp counselor, or to get a “good student discount.” After high school, these records might be needed for a job application, graduate school, or as an employment requirement for a job they desire, even 10 years from now. 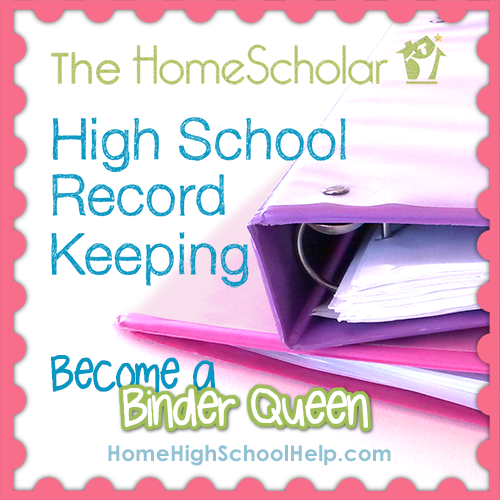 Homeschool record keeping will ensure you’ll always be prepared. Learn how to put homeschool activities on the homeschool transcript with my free Ebook. Sign up to instantly download "How to Put Fabulous Fun on Your Homeschool Transcript: Convert Natural Learning into High School Credit"
Record keeping is so important because it’s completely possible for a normal homeschool parent to accidentally forget large chunks of information. A few years ago, I was working on a transcript with a mom named Paula. She thought her transcript would be easy because she had been keeping records. In truth, her record keeping book was completely empty. We had to work through old receipts and curriculum records to create her transcript. We didn’t worry though, we simply discussed every subject area in detail, from algebra to American Sign Language. Once the records were complete, she was so happy! As I was leaving, I asked, "What are you doing this weekend?" Paula didn't hesitate for a moment, explaining they were going to a Latin competition. "Latin competition?" I said. "You never mentioned Latin!" That was how I discovered that her high school junior had already completed four years of high school Latin, and her mother had completely forgotten about it. A very large and important part of her homeschool was completely missing from her transcript, and would have stayed that way if I hadn’t asked about her weekend plans. Now it's not as if the four years of Latin was a repressed memory of something horribly traumatic. It was obvious the student enjoyed Latin - that's why she was still competing, and why they were both looking forward to the weekend. This is why we need to keep high school records. Keeping records will help us remember our homeschool experiences so we can create great transcripts and course descriptions. Record keeping is important so we don't forget broad swaths of learning, such as four years of Latin. Keep high school records so you can make a transcript that reflects the courses you taught and so you don't short-change your student. Paula is a gifted home educator, loving mother, and she had done an exceptional job homeschooling her children, and yet even she forgot four years of Latin. Never underestimate the human ability to forget, because it can happen to anyone! You can avoid a record keeping crisis of your own. Learn how to keep high school records, so this doesn't happen to you. 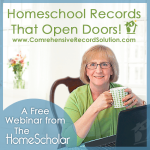 There are four basic methods of homeschool record keeping. Some parents keep all their homeschool records in a giant plastic tub in the school room. I call these parents "tubbies.” They keep all their children’s records in one single tub. All tests, assignments and papers are lovingly tossed in the top, awaiting that blessed someday when they magically become organized. Tubbies keep a lot of homeschool stuff but lack organization. Still, you can create some high school records even if you are keeping records like a tubbie. Slightly more organized are “cubbies.” As in a Kindergarten class, where each student has their own cubby, these moms use the same strategy for record keeping. They keep records in an enclosed cupboard, cabinet, or drawer. Slightly more organized than tubbies, cubbies usually have one drawer for each child and sometimes for each year as well. Cubbies keep many records with minimal organization, but at least they can tell which child did the work on each paper, since each child’s records have their own designated place. Even more organized are “binder queens.” They are the parents who keep notebooks filled with records - one child per notebook. These parents keep track of student work in highly organized, divider-filled spiral notebooks, binders, computer programs, or spreadsheets. Some fancier binder queens have a designer file folder with a carry handle. Binder queens keep information on every class, which can help them easily create records for all classes. At homeschool conventions, I can spot these parents from a mile away, with their business-like notebook and list of questions in hand. They tend to be the most organized people I meet. True confession, I was a binder queen. The final type of homeschool parents are the ones I affectionately refer to as "question marks.” When this type of parent hears about record keeping, an invisible question mark appears over their ever-so-slightly-cocked head as they think to themselves, "Records? Were we supposed to keep records?" This is the one method of record keeping that I simply can’t condone. It’s just a bad idea to stick your head in the sand, hoping that record keeping isn’t important. You can easily lose something significant, such as four years of Latin, Eagle Scout experiences, or other key ingredients needed to create your transcript and course descriptions. Each homeschool parent will decide which method is best for them. And of course, no record keeping method will work unless you use the record keeping method you choose. I usually recommend that parents try to get more organized each year. If you are a tubby the first year, try to graduate to a cubby the next year. Move up the food chain! Being a binder queen requires a minimal investment. A few dollars will get you everything you need: a 3 ring binder, a set of dividers, and some notebook paper. All it requires is a few minutes each week, making sure the binder is prepared and used instead of ignored. Using a binder system is a convenient way to keep work samples and graded work from every class. If colleges ever want to see something from Latin or Macroeconomics class, simply reach into the binder for a work sample. Simple is better. My binders were 3 inch, 3 ring binders, each with a simple label such as "Kevin 2015-2016." At the beginning of the year, label each divider in the binder. In the front of the binder, label a section for the transcript. Then arrange a section for everything required by your state law. You might include a divider for your Declaration of Intent to Homeschool, immunization records, or annual testing records. Next, label a divider for each class you intend to teach. This includes English, math, social studies, science, foreign language, P.E., fine art, and electives for the year. You can record test scores or grades for each lab or report on a simple piece of notebook paper. Store significant papers behind each divider to keep as work samples. You don’t need to keep everything, but it can be helpful to keep papers that you evaluated. Later in the year, perhaps in the spring, go back over what you learned and develop a course description for each class. If you started a class but didn’t finish, just throw that divider away; there’s no reason to record what was not done. Keeping a place for my records helped me to keep my records up to date. Every month I gathered all the papers my kids produced and gradually filled up each 3 ring binder. As the year progressed, I was able to see which sections were filling up and which sections were blank. Once the blank sections were identified, I could concentrate on developing records for those sections. When the art divider was empty, I assigned my children a one page paper on an artist. When the music section was blank, I had them list their performance-ready piano pieces and added their Christmas Recital Program to it. Keep high school level academic records. Record keeping is different from scrapbooking – it’s not an artistic endeavor. There are three big high school record keeping categories. 1. Keep anything required by your state homeschool law. This may include a declaration of intent to homeschool or an immunization record. 2. Keep what you will need for college admission. Be prepared, because you don’t always know what the future will hold. 3. Keep records needed to create course descriptions and a high school transcript. You are the high school, so you are in charge of these records. It’s relatively simple for many classes. Keep any tests or papers your child has written, and you're done! For other classes you may want to keep lab reports, tests, research papers, or short essays. Some classes don't include paper assignments, and record keeping will require some creativity. The credit value of courses such as P.E., fine arts, and other electives may be hard to quantify unless you keep track of hours. You can also make a list of the activities completed or resources used in each class. One mother asked what records she should keep for her child learning how to cook at home. Think outside the box, and consider what your child does to learn. This child created a menu, went grocery shopping, and cooked using recipes. Those are all great homeschool records! Save the menu, the shopping list, and photocopy recipes for culinary arts class records. There are many other ways to keep records. Keep a printout of the curriculum you purchase. List every book your child buys, uses, or reads for pleasure. Track hours spent on subjects, projects, or activities that aren't bookish. Keep online descriptions from internet or co-op classes. Photocopy textbook covers and table of contents. Keep any assignment sheets or schedules you create. Instead of writing down what you want your child to do in the future, you can write down what your child did after the work is completed. (This will help parents who are conscientious, but not good at planning ahead.) Have your child keep a journal of school work, including books, assignments, and experiences. Most students do some of their work on the computer, so be careful to save it in a school file on the computer or printed out in your filing box, or both. Once every spring, create and update the important high school documents you will need to demonstrate your child’s awesome home education. Plan to create an Official Transcript. This is a simple Word document, created on your home computer, with the words “Official Transcript” in the title. Each class description should have three main ingredients. First, write a descriptive paragraph about what you did. This is a simple fifth grade writing assignment, not a college thesis, so don’t over-think it. Second, include a list of what you used, from textbooks to supplements or experiences. Third, describe how you graded or evaluated, remembering that there should be more than merely tests to influence your final grade. Make a list of the books read each year. This is easier when you keep all your library and curriculum purchase receipts each year. Keep a list of the activities your child is involved in and the awards or volunteer hours they earned in each activity. Keep records early. Record keeping is not a switch that you can suddenly turn on; it can help to practice. I started training myself to keep records when my children were in seventh grade so I would be competent by the time they were in high school. If your child is in seventh or eighth grade, practice keeping your homeschool records as if they were already in high school, to be prepared for anything as you move forward. It’s common for homeschoolers to do some high school level work in middle school. Keep records often. It's a rare person who updates homeschool records every day, but every parent can manage keeping up with records every month or two. As you train yourself to keep records, strive to keep something to document every subject your child learns. Keep records in high school. Homeschool records become critical once a student begins high school as they are part of the transcript that will be shared with colleges. Begin your transcript as soon as your child is in 9th grade, or at age 14. Update the transcript and course descriptions every spring from 9th through 12th grade, until high school is complete. Right now, it’s time for a decision. Decide whether you will be a tubby, cubby, or binder queen (or king) this year. At a minimum, grab a big box and put it in your schoolroom to collect everything. Or buy a cubbie system with drawers, with one drawer per child per year. Or invest the big bucks and get a three ring binder at the dollar store, with dividers for each subject area. Prepare throughout the school year and spend some concentrated time collecting records for your homeschooled high schooler. Create documents that will impress a college or employer. Try to move up the record keeping food chain, improving over the years so that by the time your student is a senior, your transcripts and course descriptions are organized and prepared. Start small, but start somewhere! Today is the day to begin! Ready? Go! Avoid College Debt and Fast Track Your Degree! Does thinking about college admission for your homeschool student fill you with dread? Do you ever wonder how your humble homeschool can compete with those insanely rigorous college prep schools? It's true, the world of college admissions is as different from yours as Oz is to Kansas! Fear not, The HomeScholar can show you the way! Using this proven strategy, you can learn to put your student in the best possible light for college admission and scholarship consideration. In this book, you will learn how college admission has changed and what colleges now look for in prospective students, little known insights into the mind-set of college admissions officials and how you can use them to benefit your child, and the core elements of a comprehensive homeschool record that will amaze and impress colleges. You will be relieved at how achievable it is to create beautiful records and how they can give you a real advantage in the college admissions game. Parents who consider homeschooling their children through high school are often consumed by insecurity - "Are we ruining their college chances?" Well, there's no need to worry. When it comes to college admissions and scholarships, homeschoolers have what the colleges are looking for! You CAN craft high school transcripts and records that gain choice college admission and win BIG scholarships. 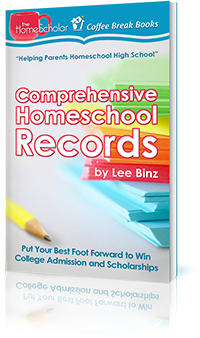 Lee Binz, The HomeScholar, has helped thousands of parents create outstanding homeschool transcripts and records. Her proven system will teach you how to present your child to colleges in the best possible light. You'll learn how to build a winning homeschool transcript, regardless of your homeschool methods or style, how to create credible grades and credits, even if you don't give tests, and how to provide the exact records the colleges are looking for. Copyright © 2016 The HomeScholar LLC, www.HomeHighSchoolHelp.com. Text may be reprinted without permission if used in full, except for use in a book or other publication for rent or for sale. Reprint must include this copyright, bio (below), and the original URL link (https://HomeHighSchoolHelp.com/cubbies-tubbies-and-binder-queens).